Looking for wrist bands that expire on their own. Tempids.com has self expiring wristbnds for your event control needs. The timing component is activated when the wristband is attached around the wrist. The expiring area changes color within one day (see image to the right) so that the person can't reuse the wristband from one day to the next. Since it is made from Tyvek material, the wrist band is tear proof and resistant to stretching with the secure adhesive closure to prevent tampering. Available with the following stock information printed on the wristband (pictured above). VIP, Legal Age, One Day Pass, Checkerboard, and No Dice. There are 1,000 self expiring wristbnds per package. Item size 1 x 10"
The wrist bands have many uses and are a popular in bars where age designation is critical. These wristbands are visible from a distance so you know who is legal and who isn't. Looking for non expiring wristbands? Tempids.com has those as well. These wristbands are also made from Tyvek material. Details" Secure adhesive closure, nontransferable wristbands that must be cut in order to be removed, numbered to assist with your accounting needs and to keep track of attendance, and it is available in 10 colors. Ideal for color coding. One idea is to color code for those of drinking age, not of drinking age, and VIPs. See above for the self expiring wristbands with those items printed on the wristbands. 10 colors of the non expiring wristbands pictured below. Colors available are purple, orange, yellow, lime green, jade, light blue, dark blue, hot pink, red, and coral. Packaging 1,000 wristbands per package. Size 1 x 10"
Call 312.662.2525 or contact customer service for more details. 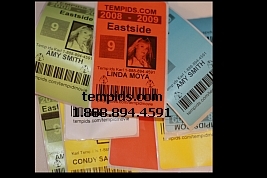 TempIDs.com all things related to Temporary ID badges -- labels, printer, software, and tech support. Using our labels for your temporary ids lets you know if someone is trying to use yesterday's Temp ID badge again today. Copyright © 2006 . Tempids.com. All rights reserved.